Social security is intended to make life easier for people suffering from disabilities, and in the long run it does just that. In the short term, however, filing for social security disability (SSD) benefits can feel like a long and frustrating process. After filing your initial claim, you may be waiting months to hear back about your case. And even when you do hear back, the answer may not be what you are looking for; in fact, nearly 68% of first-time Indianapolis claimants are initially denied social security benefits. For more information, contact an Indianapolis social security disability attorney by calling 317-634-8565. What Do I Do if my Social Security Benefits Are Denied? First of all, do not give up. As the above statistic shows, you are not alone in this problem. Social Security Offices are huge and often overburdened bureaucracies where mistakes are easily made. The good news is there is a system of appeals through which these mistakes can be corrected. The first step in appealing a denial is to contact a trustworthy Indianapolis SSD appeal lawyer. A good attorney will be able to help you understand why your claim may have been denied and what you can do to fix it. The second step will be to arrange a hearing before a judge. This is another part of the process where having an attorney can be very useful. First of all, even arranging the appeal hearing can be time-consuming and difficult. After your Indianapolis SSD appeal lawyer helps you with that, he will argue for your rights in court with the kind of persuasiveness that only a professional can have. The third step is simply a repeat of the first: do not give up. You may not get the benefits you are seeking from the first hearing. If this happens, appeal again. At the federal level of appeal, more than 60% of claimants get the benefits they need. 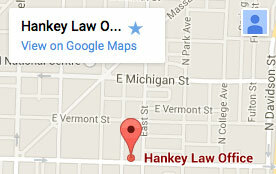 To speak with an Indianapolis social security disability appeals lawyer, contact the Hankey Law Office at (317) 634-8565.